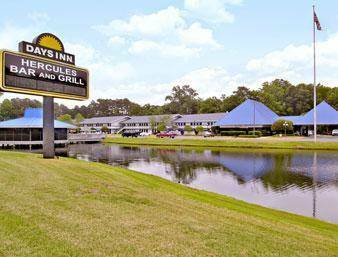 The Days Inn Airport is Located near the Savannah/Hilton Head International Airport on Dean Forest Road. The Days Inn Airport is within a short drive to downtown historic Savannah River Street and the Juliet Low Birthplace. We are only 5 miles to I-95, 5 minutes from I-16 and 4 miles from the Savannah/Hilton Head International airport, 8 miles to the Savannah International Trade and Convention Center. Our professional and hospitable service awaits the corporate or vacation traveler. Our comfortable and attractive Standard two double bed and king guest rooms offer a variety of features, free wireless internet access, in-room coffee makers with complimentary coffee, alarm clock radios, iron/ironing boards, hair dryers and 25 inch TVs with expanded cable offerings and free HBO. We also provide a free Continental Breakfast at our Hercules restaurant, outdoor pool. Call ahead for a reservation to our complimentary shuttle to the airport available between 6am and 10pm. Pets accepted with 10 dollar fee, per pet, per night, with a maximum of 2 pets per room. If you have not been to the Days Inn Airport property you have not been to Savannah. Weird, life-sized, "natural" color statue of famous winter resident Henry Ford, unveiled in 1999. The town is known as "Henry Ford City."